In today’s consumer-driven, always-on world, marketing and technology go together like peanut butter and jelly. Mastering the modern “technology stack,” however, is anything but child’s play. Not only does technology enable marketers to reach and engage connected audiences, it provides a strategic toolset for understanding customers, providing great user experiences, and driving revenue and ROI. Pressure to provide better digital experiences to empowered customers. Brands are taking a more customer-centric approach to marketing to respond to consumers’ changing behavior and their desire for more relevant and real-time experiences across channels. Desire to prove a return on marketing investments. As digital marketing budgets increase, CMOs are feeling the heat to maximize effectiveness and efficiency, and show that their campaigns are working. Need to do a better job of leveraging customer data. One of the great promises of digital has always been the potential for understanding customers better. The explosion of consumer devices has produced unimaginable quantities of data, and a crushing need to turn it into knowledge, insights and meaningful action. Marketing used to be an industry dominated by creative types, many of whom didn’t take all the “geeky stuff” too seriously. But there’s been a clear shift away from that sort of thinking. 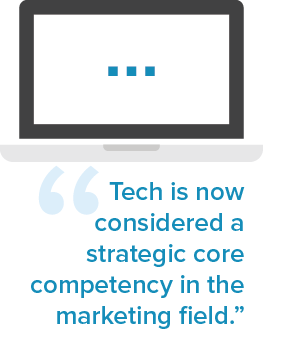 In fact, tech is now considered a strategic core competency in the marketing field: 78% of U.S. marketers and 63% of European marketers believe that it’s critical for senior marketers to have strong technology skills, according to a study from DataXu. The number of marketing technology vendors rose tenfold from 350 in 2012 to an astounding 3,500 in 2016. 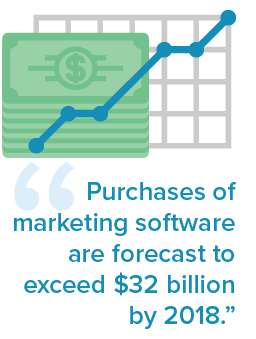 Marketing technology comprises one-third of the typical marketing budget. 59% of marketers have enterprise-wide technology strategies in place. Less than one-half of marketers say they have the right technology tools in place and 61% say their current tools are underutilized. Technology is evolving at light speed. In this dynamic environment, marketers are still finding their way in trying to assemble the right combination of platforms, solutions and tools to power their strategies and programs. This requires them to play the challenging role of technologist as they evaluate and choose new tools and platforms and learn how to use all these new capabilities. Harnessing customer data to achieve a single view of the customer across devices, as well as offline channels. Focusing on marketing to real people rather than cookies or devices. Shifting from mass audiences to mass personalization. De-emphasizing campaign-style marketing in favor of an always-on approach to cross-device customer recognition and engagement. Tapping into real-time signals to know when a customer is shopping for a product or service. 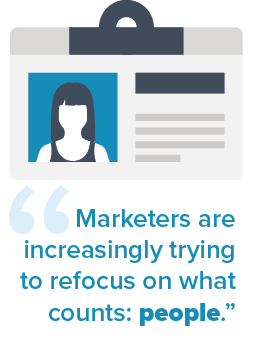 Marketers are increasingly trying to refocus on what counts: people. They’ve realized that digital marketing is moving beyond cookies and browsers, and that they can tap into their goldmines of customer data to efficiently retain customers and build brand loyalty. By taking control of their customer data and identity, brand marketers will be in a better position to control their fate, creating transformational value and sustainable competitive advantage. Having the right mix of marketing technologies in place is the first step to success. Kathy is an expert in technology marketing, with 20 years of experience creating and leading strategic, results-driven marketing programs. She was formerly the CMO at Signal.